Monaco is officially called the Principality of Monaco, and it is the most densely populated independent country. The fact that it is a small city-state in the Mediterranean Sea means that Monaco does not have natural resource unless its warm climate, that is why most of the country is one big resort that charms tourists with tasty food, pristine beaches, and tourists facilities. If you can afford it, you can get in a tux and go to the Grand Casino. The Palace Princier is something you should not miss either. A trip to Monaco may entail a visa application process. The country is a member of the Schengen Area, which means that you need a Schengen visa. That is not the case if you are from a European Union country, as well as from one of the European Economic Area countries. Second of all, the Schengen visa policy includes a list of visa waiver countries (Annex II). Their nationals can go anywhere within the Schengen Area for up to 90 days without a visa. All the other nationalities must apply for a Schengen Visa. If you need to find out quick in which category you are, just take a look at the visa policy of the Schengen Area. Or better yet, use iVisa’s Visa Checker. It is a simple tool that gives you the information you need in just a second. You must access the tool, which is located in the top right corner of this page, and follow the steps. You choose your nationality from the drag-down menu on the left and put Monaco in the menu on the right. If you do not need a visa, you will be notified, and if you do, the Visa Checker can provide a list of the nearest embassies where you can apply for your Schengen Visa. 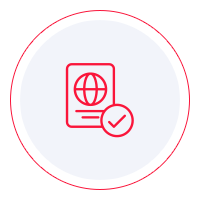 You cannot obtain a Schengen Visa online, which is why iVisa cannot help you much at the moment. However, we would like to assist you in any way that we can, which is why our support service is at your disposal 24/7 and is entirely free of charge. When you need a Schengen visa, you need to establish to which embassy you need to go and apply. That is because the rules about this are pretty strict. In consequence, if you want to travel to Monaco only, you need to go to its nearest embassy to get your Schengen visa. However, a lot of people visit multiple European countries during the same trip, in which case, the rules are slightly different. So, if you visit several Schengen countries, you must go and apply for your visa at the embassy of the country that is your main destination. If you cannot tell which that is, then you must go to the embassy of the country that you decide to see first. The bottom line is that if you visit France and then Monaco, the Schengen visa issued by the French embassy grants you entry in Monaco as well. Unfortunately, we cannot provide more assistance at the moment, but we do hope that you find the information above useful.